Zavod Udarnik in organizacija MITRA Vas vabita na zadnji večer multikulturnosti v tekočem letu, ko se bomo prvič obrnili na Jug in se posvetili velikemu zelenemu kontinentu – Afriki. 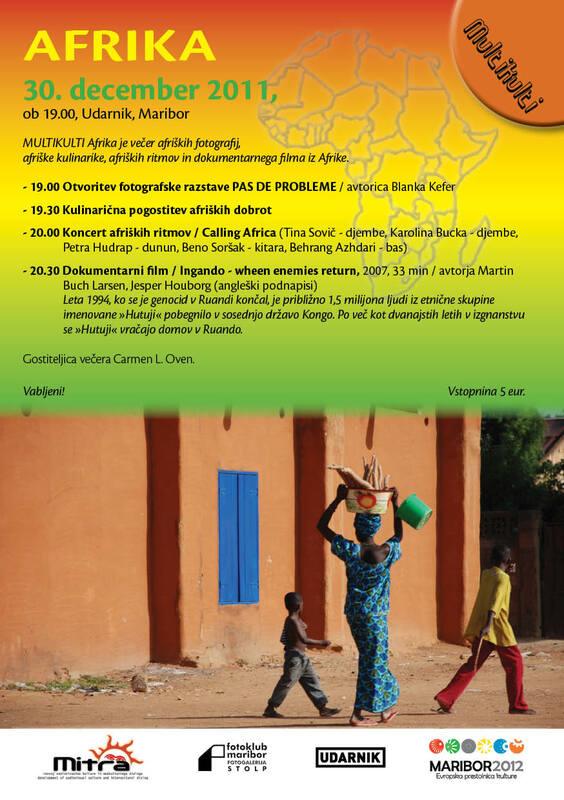 MULTIKULTI Afrika je večer afriških fotografij, afriške kulinarike, afriških ritmov in dokumentarnega filma iz Afrike. In 1994, when the Rwanda genocide ended, an estimate of 1.5 million people from the ethnic group called ‘Hutus’, who somehow had been involved or affected by the genocide, fled to the neighboring country of DR. Congo. After more than 12 years in exile, a growing number of ‘Hutus’ are now returning home to Rwanda. Before they are allowed back to Rwanda as civilians, they are all requested to pass through an Ingando camp (transit-camp), where they are de-mobilized, educated and prepared to return home as civilians. The film follows to former soldiers’ lives in the Ingando, and gives a voice to their thoughts and dreams of a positive return. Dreams, which will later be challenged by skeptical genocide survivors, who may become their future neighbors. Gostiteljica večera Carmen L. Oven.